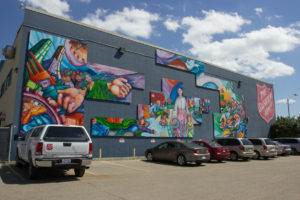 To create this mural, nine young Albertans took panels to Nicaragua and El Salvador, joining with southern youth groups to paint the 10’ x 20’ central panel. As the extended team discussed peace, respect for life and planet, and solidarity, they created and exhibited the growing murals through Nicaragua and El Salvador. Then six young southerners visited Alberta for five weeks and shared their stories. This culminated with Peace Week, a celebration of social justice through art. All three murals encompass the local and global concerns of youth and their hopes for a truly peaceful world.